Must start knitting hats immediately!!!! 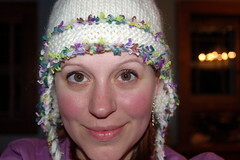 I love this hat, I've already worn it around the house and to the grocery store a few times. It will definetely be coming with me to Wyoming on Saturday. I just bought some Malibrigo last night for another new hat - a beret! Pics to come after Thanksgiving. That is such a cute hat!! I love the pattern and colors/novelty yarn that you chose. I too love to knit, live in MN, and am really bad at knitting things for myself! i really love the hat...in fact i saw it on your flickr page and i decided that i should learn how to knit hats....so i put like 10 books on knitting and knitting hats on hold at the library. woo hoo! Love the hat - one of my favorites!